Can you believe this is the FOURTH year of 100 children’s picture books? Every year I think, “well, that’s it. There are officially no more good picture books that I haven’t talked about” and then by the next summer, I have 100 brand new children’s picture books to add to the list. I try to do a combination of new and older titles, children’s picture books that are wildly popular and ones you might not have heard of yet, and a mix of silly, sweet, and smart. There’s also a printable version of this list available, so if you want to print it out the full list 2018 children’s picture books list and mark them off as you read them or use it as a reference at the library or bookstore this summer, you can grab that at the bottom of the post! Cycle City by Alison Farrell. If you loved Richard Scarry, this book is for you – so many things to look at and specific things to find on each page. Who Was That? by Olivier Tallec. My girls are obsessed with this children’s picture books series. They are short picture books with little mysteries on each page or things to remember from the previous illustration and we’ve read all of them dozens of times. Moon by Alison Oliver. When a little girl decides she’s tired of her same old routine, she heads to the forest to learn how to be wild from a pack of friendly wolves. Before She Was Harriet by Lesa Cline-Ransome, illustrated by James E. Ransome. This is one of the most beautiful picture book biographies I’ve ever seen. When you can make the incredibly famous story of Harriet Tubman feel fresh and new again, that is a gift. The Wolf, The Duck and The Mouse by Mac Barnett, illustrated by Jon Klassen. I’ll never get tired of this duo, but this one might be my favorite one they’ve done yet – it is HILARIOUS. Toad on the Road by Stephen Shaskan. With a rhythm that reminds me of Room on the Broom, this book is catchy and a quick read about a little toad who keeps hopping into the middle of the road and the vehicles coming along keeping having to swerve to avoid him. This Book will Not Be Fun by Cirocco Dunlap, illustrated by Olivier Tallec. There will be beige walls and absolutely no dancing. Okay, maybe a TINY bit of dancing. After the Fall (How Humpty Dumpty Got Back Up Again) by Dan Santat. I’ve sung Humpty Dumpty (off-key) approximately 40,000 times, and yet this book made me see this famous rhyme in a whole new amazing light. I LOVE this book. Margaret and the Moon by Dean Robbins, illustrated by Lucy Knisley. When you send up an astronaut, there’s a whole slew of other people working behind the scenes to make it happen. And Margaret Hamilton was one of those. I love this story of a smart, passionate woman who wasn’t afraid of math and science. Lion Lessons by Jon Agee. Who wouldn’t want to be a lion? Sadly, it turns out to be harder than it looks when a little boy shows up to take lion lessons from the king of the jungle. Escargot by Dashka Slater, illustrated by Sydney Hanson. This hilarious story of a small snail who just wants to be someone’s pet is best read in an outrageous French accent. A Bargain for Frances by Russell Hoban, illustrated by Lillian Hoban. My all-time favorite Frances story (which is saying something, because I love ALL her stories) about a tea set and a friend who plays a trick. The Sound of Silence by Katrina Goldsaito, illustrated by Julia Kuo. If your summer needs a little bit of silence, this quiet, calm book is perfect. I love this sweet book about a little boy who tries very hard to hear silence in his daily life in the city. Little Red and the Very Hungry Lion by Alex T. Smith. In this Little Red Riding Hood retelling, the wolf gets swapped for a lion in Africa. And he’s STILL no match for Little Red. I’m My Own Dog by David Ezra Stein. This dog doesn’t belong to anyone. He’s his own dog. But when he finds a man alone, it seems like maybe it’s time to train that man to fetch and go for walks. Say Zoop! by Hervé Tullet. I mean, who is ever going to say no to a follow-up book to Press Here? No child I know! Tea Party Rules by Ame Dyckman, illustrated by K.G. Campbell. Cub discovers a backyard tea party going on and joins because, well, cookies. But is ANY cookie worth how difficult it is to play along with the young hostess? Here We Are by Oliver Jeffers. This sweet book was written by Oliver Jeffers to celebrate the birth of his son and it is charming and absolutely wonderful. It’d make a GREAT baby shower gift but my two-year-old asked for it every day for a month too. Girl Running: Bobbi Gibb and the Boston Marathon by Annette Bay Pimentel, illustrated by Micha Archer. This is non-fiction at its best – I absolutely teared up reading this about the first woman to run the Boston Marathon, despite everyone who told her that women couldn’t run that far. Dear Girl by Amy Krouse Rosenthal and Paris Rosenthal, illustrated by Holly Hatam. I’ll never get tired of Amy Krouse Rosenthal (and I’m devastated by her death last year). This book is just the sweetest tribute from a parent to a beloved, brave little girl who is growing up but can always come home. Lately Lily: The Adventures of a Traveling Girl by Micah Player. A little girl goes all around the world with her parents and her beloved striped zebra. Sweet and simple. They Say Blue by Jillian Tamaki. Everyone says the ocean is blue or the sky is blue, but sometimes they’re all different colors. Little Poems for Tiny Ears by Lin Oliver, illustrated by Tomie dePaola. The sweetest book of brief poems for babies and toddlers. And of course, everything is better with Tomie dePaola illustrations. Don’t Blink! by Amy Krouse Rosenthal, illustrated by David Roberts. This book made us all laugh so much – it reminds me of The Monster at the End of This Book. All you need to do to stay awake is make sure you don’t blink. Which is harder than you’d think. Wolf in the Snow by Matthew Cordell. This book won the Caldecott medal and it’s a beautiful story of a wintery evening when a little girl and a little bear cub both find themselves lost in the snow. Papa Bear’s Page Fright by Wade Bradford, illustrated by Mary Ann Fraser. This clever re-telling of Goldilocks and the Three Bears breaks the fourth wall when Papa Bear discovers he has an audience and starts bungling his lines. And Away We Go! by Migy. If a hot air balloon ride sounds pretty magical to you, this book will just delight you. Tap the Magic Tree by Christie Matheson. If you love Press Here, this is a similar interactive book where a tree responds to your actions as you flip the pages. Bring Me a Rock! by Daniel Miyares. A grasshopper king is hard to please with his demands for the highest throne imaginable. Dad and the Dinosaur by Gennifer Choldenko, illustrated by Dan Sanat. This is the sweetest book about a little boy who is only brave when he has his plastic dino with him and his dad who steps in when that dino (and the little boy’s bravery) go missing. The Boy and the Whale by Mordicai Gerstein. When a young boy and his dad find a whale tangled in their fishing net, the dad tells him to leave it alone. But the boy can’t stand the thought of the whale dying in that net and takes matters into his own hands. Pete and Pickles by Berkeley Breathed. In this wacky story, Pete, a very orderly pig, finds his life disrupted when a circus elephant, Pickles, escapes and finds refuge in Pete’s home. A Thousand Billion Things (and Some Sheep) by Loic Clement, illustrated by Anne Montel. This is an I Spy book for parents who don’t want to spend forty years getting through one book. I believe I read this 46 times last month. Nothing Rhymes with Orange by Adam Rex. I laughed myself silly over this book and the little video the author made to accompany it is just the cherry on top (orange on top?). Wally Does Not Want a Haircut by Amanda Discoll. Wally’s fleece is getting out of control. But he 100% does NOT want a haircut. Don’t even think about it. The Backup Bunny by Abigail Rayner, illustrated by Greg Stones. Like any wise mother, Max’s mother has a backup bunny in case the beloved bedtime bunny goes missing. But Max isn’t fooled. Not for one minute. The Three Billy Goats Gruff by Jerry Pinkney. I love Jerry Pinkney’s retellings of famous stories and this was my girls’ #1 pick for our Mock Caldecott this year. Tad and Dad by David Ezra Stein. Tad is a tiny tadpole who wants to be just like his dad. He also would prefer not to sleep alone because . . . that’s scary. Perfect for any child who has ever begged to sleep with their parents. Babies Ruin Everything by Matthew Swanson, illustrated by Robbi Behr. When a new baby arrives, it appears it might be a defective baby. It cries, it doesn’t care about presents, and it won’t even play. But maybe the baby just needs a better big sister. My Pillow Keeps Moving! by Laura Gehl, illustrated by Christopher Weyant Is my pillow defective? Or is my pillow actually a dog? The Best Birthday Present Ever! by Ben Mantle How good can a stick be? It turns out it IS the best birthday present ever. I Really Want to See You, Grandma by Tarō Gomi. When a little girl heads off to see her grandmother, it turns out the grandmother is headed out to see HER and they just miss each other. Rulers of the Playground by Joseph Kuefler. Everyone wants to be ruler of the playground! But is ruling as much fun as playing? Maddi’s Fridge by Lois Brandt, illustrated by Vin Vogel. It’s easy to complain about dinner until you go to your friend’s house and discover that her fridge is almost bare. Is it wrong to break a promise not to tell anyone? The Forever Garden by Laurel Snyder, illustrated by Samantha Cotterill. A little girl loves her elderly neighbor and working together in her garden, until the neighbor announces she’s moving. Will a new family appreciate that beautiful garden? Bunny the Brave War Horse by Elizabeth MacLeod, illustrated by Marie Lafrance. This story about the war horses sent over to Europe during the World War I is both sweet and heart-breaking. La Princesa and the Pea by Susan Middleton Elya, illustrated by Juana Martinez-Neal. This re-telling of the famous fairy tale takes place in Peru with lots of Spanish words sprinkled in. We all LOVED it. Finding Winnie by Lindsay Mattick, illustrated by Sophie Blackall. This Caldecott winner is spectacular about the bear that inspired Winnie the Pooh. I need to buy my own copy of this. Charlie & Mouse & Grumpy by Laurel Snyder. Somewhere between picture book and early chapter book, I LOVED these short stories about two brothers and their grandpa who is visiting. The Boo-Boos That Changed the World: A True Story About An Accidental Invention (Really!) by Barry Wittenstein, illustrated by Chris Hsu. A fabulous and funny book abut how band-aids were invented. Everything You Need for a Treehouse by Carter Higgins, illustrated by Emily Hughes. This whimsical book imagines all the most elaborate amazing tree houses you could build. Pretty sure my girls are scheming up plans for their own as we speak. Bus! Stop! by James Yang. When a little boy misses his bus, he keeps seeing different buses come by, each one more unusual and interesting than the last. Tea Rex by Molly Idle. This has been one of the most popular books in our house for years about a little brother and sister who host a tea party for their dino friends. Who turn out to have questionable manners. Big Cat, Little Cat by Elisha Cooper. This Caldecott Honor book is drawn all in black ink outlines and tells the story of a new cat who joins a family where Big Cat gently shows how things are done. Bob, Not Bob! by Audrey Vernick and Liz Garton Scanion, illustrated by Matthew Cordell. For anyone who has ever had a cold and tried to talk, this book will have you in stitches. I’m not one of those moms who reads in a fun voice, but you just can’t help yourself with this one. Professional Crocodile by Giovanna Zoboli, illustrated by Mariachiara Di Giorgio. This wordless book took me completely by surprise with the clever twist at the end. Windows by Julia Denos, illustrated by E. B. Goodale. A quiet evening walk gives you a chance to see everyone else’s evenings unfolding in the most ordinary and magical ways. Get Out of My Bath! by Britta Teckentrup. One animal after another keeps piling into the bathtub until Ellie the elephant has HAD ENOUGH. Egg by Kevin Henkes. Four eggs. But only three hatch. What’s wrong with the fourth one? Round by Joyce Sidman, illustrated by Taeeun Yoo. So many round, wonderful things in the world and this book beautifully explores some of them. Welcome to the Zoo! by Alison Jay. This wordless book is full of things to find and my girls never get tired of poring over the pages. The Little Red Cat Who Ran Away and Learned His ABC’s (the Hard Way) by Patrick McDonnell. I love Patrick McDonnell’s fabulous spin on an alphabet book. Just when you think you’ve read every possible kind of ABC book, he makes you see it in a whole new one! Green Pants by Kenneth Kraegel. Jameson wears green pants. Period. But when he’s asked to be a in a wedding, can he stand to wear black pants with his tux? Love Is by Diane Adams, illustrated by Claire Keane. This sweet book is perfect for Valentine’s Day, but just as delightful the rest of the year too. Ruby, Violet, Lime by Jane Brocket. This is one of my favorite color books ever – it’s just SO pretty. Lady Pancake & Sir French Toast by Josh Funk, illustrated by Brendan Kearney. It’s a beautiful friendship until they both discover that there is only one drop of syrup left. Now it’s a RACE to see who can get it first. Not Quite Narwhal by Jessie Sima. Is he a narwhal? Or is he a unicorn? The Way Home in the Night by Akiko Miyakoshi. This is the perfect bedtime story as a mother rabbit carries her tired child through the quiet dark streets and they see everyone else in their homes beginning their evening routines. Mr. Tiger Goes Wild by Peter Brown. Everyone in Mr. Tiger’s town is very refined. But one day, Mr. Tiger decides it might be fun to be . . . just a little bit wild. Little Wolf’s First Howling by Laura McGee Kvasnosky, illustrated by Kate Harvey McGee. Little Wolf has waited so long to go out with his father and howl at the moon. But when the big moment comes, it’s not quite a howl that emerges. The Girl who Thought in Pictures: The Story of Dr. Temple Grandin by Julia Finley Mosca, illustrated by Daniel Rieley. This picture book story of Temple Grandin is a perfect way to discuss differences and autism. It also has a great section at the end with more detailed information about Grandin and her work. The Day the Crayons Quit by Drew Daywalt, illustrated by Oliver Jeffers. The crayons have had enough. And before they head out, they’re going to tell their owner exactly what he’s done to annoy them. It’s Not Jack and the Beanstalk by Josh Funk, illustrated by Edwardian Taylor. Jack is so tired of the bossy narrator telling him to sell his cow (for beans?!) and then insisting he climb the beanstalk and kill the giant. Can he make a few decisions of his own, please? If You Give a Mouse a Cookie by Laura Joffe Numeroff, illustrated by Felicia Bond. One of the classic children’s picture books. I can’t believe I’ve never included this one. Perfect for reading and then making cookies together. Just make sure you have milk. La La La by Kate DiCamillo, illustrated by Jaime Kim. Can you imagine an entire book written with only the word La? Kate DiCamillo can. A little girl sings but gets no response so she heads out to find an audience somewhere in the world. A Hundred Billion Trillion Stars by Seth Fishman, illustrated by Isabel Greenberg. For every child who loves numbers, especially big numbers, this book is fascinating and totally accessible. Max and Marla by Alexandra Boiger. Max and Marla are Olympians. Well, at least they hope to be. After all, what else would a little boy and his pet owl do during the winter months? All the Awake Animals Are Almost Asleep by Crescent Dragonwagon, illustrated by David McPhail. I mean, just the author’s name is reason enough to read this book but it’s ALSO a fantastic alphabet book. Snippy and Snappy by Wanda Gag. You might know her best from Millions of Cats, but we also love this book from the 1930s about a little mice sibling duo that venture into the house of a human and barely escape with their lives. Flotsam by David Wiesner. I’m not allowed to do a list of children’s picture books without David Wiesner included and this one (which won one of his three Caldecott medals) is the perfect summer adventure. Part Time Princess by Deborah Underwood, illustrated by Cambria Evans. My girls LOVE this one about a little girl who is a normal girl by day and then spends the night being a princess. Have You Seen My Monster? by Steven Light. This is a really fun early search-and-find book that’s been a big hit in our house with my littlest readers. Groovy Joe: Dance Party Countdown by Eric Litwin, illustrated by Tom Lichtenheld. The day we get tired of Groovy Joe is the day we are no longer a fun family at all. I’ll keep adding these children’s picture books to my collection as long as they keep coming out. I Didn’t Do My Homework Because. . . by Davide Cali, illustrated by Benjamin Chaud. My girls are obsessed with this whole series that is wacky and accompanied by perfectly weird illustrations. Those Rebels, John and Tom by Barbara Kerley, illustrated by Edwin Fotheringham. The Fourth of July is just around the corner, so you don’t want to miss out on a fun introduction to American history. A Stick is an Excellent Thing by Marilyn Singer, illustrated by LeUyen Pham. A collection of poems all about outdoor play, which is basically perfect for summer. This is one of the few poetry books that my children beg to read over and over again. A Year in the Woods by Henry David Thoreau, illustrated by Giovanni Manna. If you don’t actually get Thoreau at all, this book makes it so much more accessible while using the original text. Bunny Roo I Love You by Melissa Marr, illustrated by Teagan White. Written by the author for her adopted son, I love this tender baby story. Sleep Tight Farm by Eugenie Doyle, illustrated by Becca Standtlander. This one makes me want to move to a farm and grow all my own food. Too Many Toys! by David Shannon I always pull this one out around the holidays to remind my children that YES there is such a thing as too many presents and too many toys. A Bear Sat on My Porch Today by Jane Yolen, illustrated by Rilla Alexander. This is Jane Yolen’s 100th book, and it’s delightful, about a little girl who finds one woodland creature after another trying to take up residence on her porch. The Day the Babies Crawled Away by Peggy Rathmann. One of my favorite baby books, the lyrical text and twilight illustrations are just plain magical. Busy Bunny Days by Britta Teckentrup. When you need a book to keep you busy for a long time, this book, with three different days in the life of a little bunny family, has a million things to look at on every page. Counting Lions by Katie Cotton, illustrated by Steve Walton. This beautifully drawn book shows endangered animals that need help. It is truly spectacular. A Farm for Maisie by Jennifer Chrchmann, illustrated by John Churchmann. I have read this one SO many times to Star over the past few months about a sheep dog who learns how to take care of her little flock. It’s especially fun because all the images are photographs. Most People by Michael Leannah, illustrated by Jennifer E. Morris . When the world seems dark and unfriendly, it helps to remember that most people are kind and want to help. This is one of the children’s picture books I turn to when world events make our planet feel scary. Playtime? by Jeff Mack. Using only two words, this book shows the delightful interactions between a gorilla who wants to play all night and the little boy who just wants to go to sleep! You can also check out the 2015 list, the 2016 list, and the 2017 list if you want even MORE children’s picture books suggestions. And if you’d like a printable version of this list, just pop in your email address below and it’ll come straight to your inbox! Hooray! Check your email for your free downloadable list of 100 picture books! Every year on the night before my sons’ birthdays, I read them the same picture book. My older son’s is “Someday” by Alison McGhee and my younger son’s is “Love” by Matt de la Pena. I read “Dear Girl” by Amy Krouse Rosenthal earlier this year and plan to have that as the birthday eve book for my niece, who will be three in July. It’s such an amazing book. I look forward to this list every year! Thanks for all the work you put into this! Thanks for putting this great list together! Some of our favorites (so much love for After the Fall), but a whole bunch of books I’ve never heard of. I’m off to max out our holds! 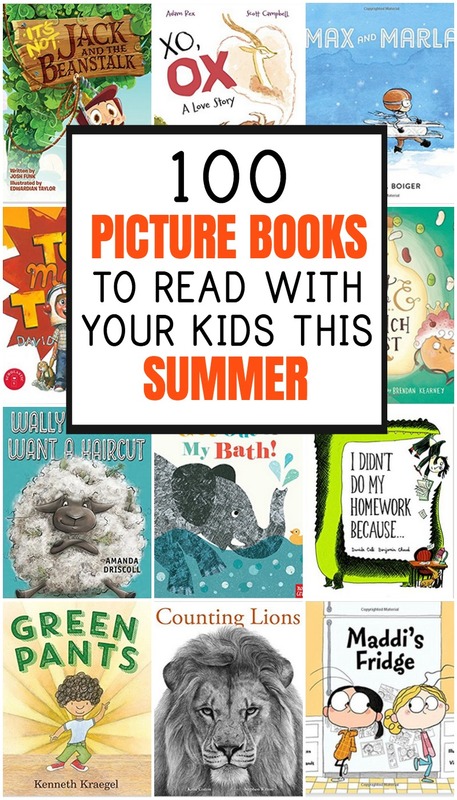 This list every year largely dictates what we’ll be getting from the library all summer! It’s so fun to have a whole list of good books to work through! Very much appreciate the time you put into this! I’m very excited to have found your blog. I look forward to reading the books from the list you put together to my 5 year old daughter. Please find below a short list of books that come to mind that we recently read and enjoyed for various reasons.